Our aim is to make sure that Subaru owners have quick, easy access to having their affected vehicle rectified regarding the Takata airbag recall. Please use our Takata Recall Status Tool below to confirm if your Subaru vehicle is affected or not affected by the Takata airbag inflator recall. If your Subaru is affected by this recall, you will be able to confirm the current status of the recall on your vehicle. Please enter either your vehicle's registration and registration state or VIN. The VIN must be exactly 17 characters in length. We have been contacting affected owners involved in the Takata airbag recall, if you have not received any communications from Subaru Australia but believe your vehicle is affected please contact our dedicated Recall Contact Centre on 1300 550 994 or your Subaru Service Centre immediately. It is also very important that we have your most up-to-date contact details. If you believe Subaru Australia does not have these, please provide your most current contact details by completing the online form here. Please take note that any replacement airbag installed in your vehicle following a collision or other incident may also be a Takata airbag inflator. 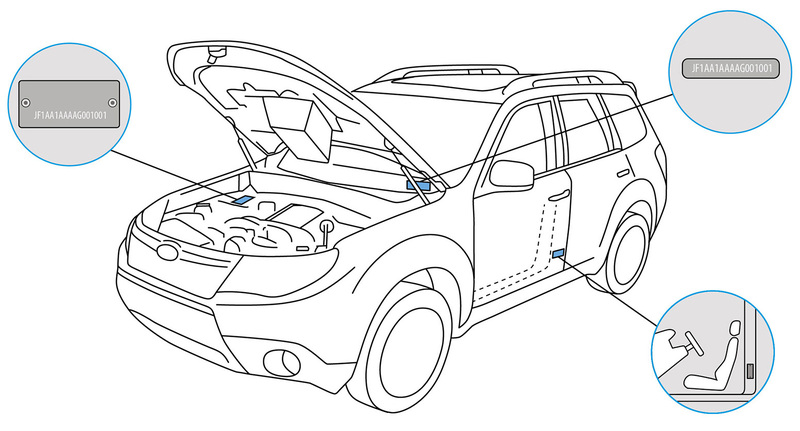 It is critical that you urgently contact a Subaru Service Centre immediately to arrange for the airbag to be inspected and replaced, if required. *Colour is for representative purposes only and will not be an exact match. The Subaru VIN/registration number you entered is not affected by the Takata airbag inflator recall. Please click here to check if this Subaru vehicle has been subject to any other recalls. If you have any questions relating to Subaru Australia initiated recalls, please contact our dedicated Recall Contact Centre on 1300 550 994 or email feedback@subaru.com.au. We have no record of this VIN/registration number in our system. Please double check the VIN (Vehicle Identification Number) or registration number and state/territory entered. If this vehicle is not a Subaru vehicle, please visit the Australian website of the relevant manufacturer. If this vehicle is a Subaru vehicle, it may have been imported into Australia by a third party. In this case please contact our dedicated Recall Contact Centre on 1300 550 994 or email feedback@subaru.com.au. 1300 550 994 Monday to Friday 8:00am to 8:00pm AEST and Saturday 8:30am-5:00pm AEST. Alternatively, you can email us at feedback@subaru.com.au You may also report any concerns you have regarding this recall to the ACCC at productsafety.gov.au/contact-us/for-consumers/make-an-enquiry. Click here if you need help in another language or call our Recall Contact Centre on 1300 550 994 who will be able to assist you with translation services. If you are deaf, or have a hearing or speech impairment, contact us through the National Relay Service by calling 1800 555 660 and ask for 1300 550 994. For more information, visit relayservice.gov.au. Recall Status Tool Disclaimer: The Recall Status returned by this tool is based on information from multiple sources, (including third party sources). Further, in some circumstances there can be a delay between the time work is conducted and the time it is reported into our systems. Whilst Subaru Australia has taken reasonable precautions to ensure accuracy, the Recall Status may not be up to date as at the date of your search. To the maximum extent permitted by law Subaru Australia disclaims all liability arising from any inaccuracy or reliance on information produced by the Recall Status Tool. If you have a question or comment regarding the Recall Status of your vehicle as reported above please contact the Subaru Recall Contact Centre on 1300 550 994 or email feedback@subaru.com.au.